You don't need special powers to make a great apple pie. Our step-by-step recipe and expert guidance will help you get there. You'll see it's easy once you get rolling. 1. GREAT apple pie begins with the crust. Start by cutting shortening into the flour with a pastry blender. Don’t blend too much or your pastry will be tough. 2. ROLL out dough between sheets of plastic wrap. This way the dough won’t stick to the counter or the pin. 3. ONCE the dough is rolled out, peel off the top sheet and invert the dough into the pie plate. Remove the second sheet and you’re ready to fill. 4. EVENLY distribute the apple filling in the pie. 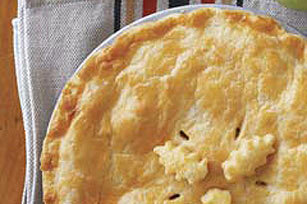 Use firm, tart apples like Granny Smith so they hold their texture while cooking. Cornstarch gives you a clear, juicy filling. 5. CRIMP crust edge with two fingers, pressing a V-shape into the dough. Don’t worry about it being perfect – an uneven edge adds to the trendy look of homemade! 6. GARNISH each slice with 2 Tbsp. of thawed Cool Whip Whipped Topping for a simple, tasty accompaniment.